Louise longed to have a baby with her husband of 18 years, however when attempts to reverse the effects of Tony’s earlier vasectomy failed the couple were becoming resigned to the fact that it was not to be – until a friend suggested the possibility of using donated sperm. Tony begins: “I was travelling a lot with my work during the 90s and met my future wife Louise by chance. We fell in love and she left her own family and friends behind to come and live with me in the UK, ending up in Peterborough. The couple visited their GP who referred them to a private fertility consultant. The consultant told them that the chances of a reversal being successful were less than one percent because Tony’s vasectomy had been done over 30 years beforehand. However, the consultant went on to tell them about sperm extraction which carried a better chance of success. They agreed to give it a try and were referred to a Nottingham fertility clinic. Unfortunately, despite managing to surgically extract some sperm that were able to fertilise two of Louise’s eggs, the implanted embryos didn’t survive the first month. The couple weren’t eligible for NHS funding as Tony had children from a previous marriage, so the couple began researching clinics themselves where they could have IVF with donated sperm. Bourn Hall Clinic has its own sperm bank, with contributions from both altruistic donors and those going through treatment. The latter may choose to sperm share in return for free IVF. A new satellite clinic had just opened in Peterborough, so Tony and Louise decided to go there for their initial consultation and were among the very first patients. For the couple it was important they had as good a match as possible to Tony. Although donors are anonymous they write a short description of themselves and why they have decided to donate and often include a short message to be given to a future child. Louise began a course of injections and medication in advance of IVF. “Louise is amazing and very accepting of whatever has to be done. She knew taking the medications would help improve her chances of becoming a mum so never complained. In August 2014 at the Cambridge Clinic, ten eggs were collected from Louise and the best four selected to be individually injected with a single sperm from the donor to help fertilisation occur, a procedure known as Intracytoplasmic Sperm Injection (ICSI). The resultant embryos were then cultured in the laboratory for a few days until they became blastocysts, with the best quality ones being selected for implant. The couple opted to have one embryo transferred into Louise’s womb and the others frozen. In mid-April 2015 Mia was born, much to Tony and Louise’s joy. “I am delighted to have Mia in my life; she is gorgeous and I’m incredibly proud of her. She’s definitely my daughter and I love her to bits. “We were a hundred percent happy with our experience at Bourn Hall. 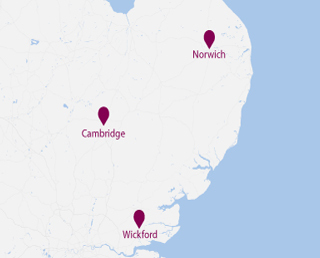 Having the convenience of the Peterborough satellite for our routine appointments was great, plus we got to visit the beautiful and original clinic in Cambridge for the egg collection and embryo transfer. “I’d certainly recommend Bourn Hall and suggest using donor sperm to others in our position, but ultimately it has to be the couple’s choice.